Sun., Feb. 19, 2017, 5:10 a.m. Growing up in Philadelphia, Gary Stokes loved to read. Since the library system limited youngsters to five books at a time, he made frequent visits. One day, a skeptical librarian questioned whether Stokes really read all the books he took home. Stokes insisted he had, so the librarian opened one of the books and began quizzing him. Among Stokes’ favorites were Encyclopedia Brown mysteries, and biographies of astronaut John Glenn and baseball legend Jackie Robinson. 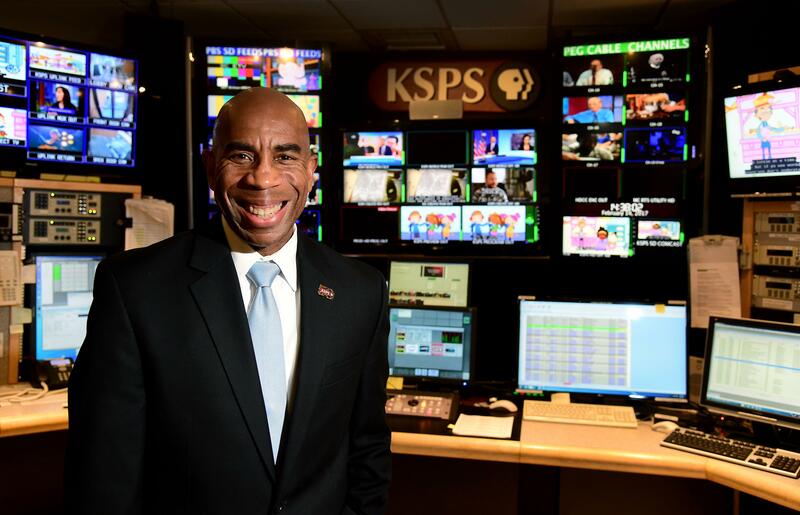 Stokes is president and general manager of KSPS Public Television, which celebrates its 50th anniversary this year. During a recent interview, he discussed “Downton Abbey,” the Canadian dollar and rabbit ears. S-R: Besides reading, what were your interests growing up? Stokes: Music. I started playing French horn in elementary school. In high school, I played in orchestra and band, and sang in choir. S-R: Did you envision a particular career? Stokes: I thought I would get a law degree, work as a prosecutor, become a judge, and then be president. S-R: Why a legal career? Stokes: Growing up I watched an awful lot of television and saw a lot of lawyers – “Perry Mason” … “Judd for the Defense.” But it was also a sense of justice. That’s how I ended up as a criminal justice major at the University of Dayton. Stokes: The summer after high school I was a counselor at a day care center. Once in college, I worked summers in the stockroom of a factory that made baby clothes. We worked six-day weeks, grabbing boxes and getting them over to shipping. When you’re in college it’s nice to have something physical that gets you out of your head. Stokes: I was accepted to law school but couldn’t afford to go. So I went to work as a probation officer for the Montgomery County Juvenile Court in Dayton. Then I recalled an encouraging conversation I’d had in college with the news director of the local CBS affiliate. So I called him up and asked if there might be a job for me in television. A month later, I was working as a reporter in the 48th largest market in the U.S.
S-R: What was your career path from there to KSPS? Stokes: I held various reporting and management positions at commercial stations in Dayton, Dallas, Washington, D.C., Norfolk, Baltimore, Houston, Buffalo and Birmingham. In 2006, I joined Alabama Public Television, my first PBS job, as manager of corporate support, and later was promoted to VP of development. I was hired here in 2011 as executive director of Friends of KSPS. When the broadcast license was transferred from the Spokane School District to the Friends of KSPS two years later, I was made president and general manager. S-R: That’s a lot of moving around. Stokes: It’s typical in broadcast for several reasons. Either a better job comes along or new managers bring in their own people. But the time I’ve spent in public broadcasting has been the most rewarding of my entire career. Stokes: It’s all about the mission. It’s still television, but television that makes a difference – that helps educate, inform and enrich our viewers’ lives. S-R: Do you have a personal mantra? Stokes: “Keep moving forward.” If something gets in your way, either go through it or around it. But keep moving. S-R: How has KSPS changed since your arrival? Stokes: Television is constantly evolving, because people consume it differently than when I was growing up in the late ’50s and early ’60s. When I was a kid, we only had a handful of stations, and I was the remote control. My dad would say, “See what’s on channel 6.” The biggest change for us since I arrived was the broadcast license transfer in 2013. Stokes: When most public television stations started, their license was granted to either a college or local school system, and the stations were used as an extension of classroom learning – everything from geography to driver’s ed. As programming became more varied, the Spokane School District sought help raising funds. In 1972, volunteers established the Friends of Seven, which became Friends of KSPS. When I arrived, there was talk of transferring the license from the school district to the Friends of KSPS, but it took the better part of a year to work out the details. The most important piece of the puzzle was shifting an entire group of school district employees over to an organization they had previously only cooperated with. S-R: What was the station’s financial health at the time of the transfer? Stokes: This has always been a vibrant organization. S-R: Has your budget grown since then? Stokes: Yes, but the cost of raising money is going up. Most of our key donors are people who have supported the station for years – older viewers who appreciate the importance of public television. Younger folks don’t necessarily think of us when they think of philanthropy. But thanks to programs like “Downton Abbey” and “Sherlock” and the resulting demographic shift, corporate sponsorship is becoming more broad-based. S-R: Did the recession take a bite out of contributions? Stokes: Yes. Also, because a significant portion of our audience and donor base is in Alberta and British Columbia, when the Canadian dollar takes a hit, we feel it. S-R: Besides payroll, what are your big line items? Stokes: We pay PBS dues in excess of $1.5 million a year. We also buy shows such as our Thursday mystery programs. S-R: Which shows are most popular? S-R: Which show is your favorite? Stokes: As much as I enjoy “Masterpiece,” “Frontline” is still my go-to. I started out in television on the news side, and I think “Frontline” does the best job of long-form investigative journalism on television. S-R: Many of your former school district employees have been with the station for decades. How will you handle the inevitable wave of retirements? Stokes: I was at a retirement party last night, so we have those discussions all the time. We are cross-training as best we can, and have talked about building a robust internship program. S-R: You recently were elected to a three-year term on the PBS board of directors. How will that help KSPS? Stokes: It’s too early to tell. My second meeting will be this month. But it’s good to have a seat at the table. S-R: What’s been your best idea so far? Stokes: The “Downton Abbey” marathon, which started on a Friday afternoon and went all the way to Sunday night. We were the first station in the country to do that. PBS later rolled it out to all of the other stations, and they had success with it. S-R: What are the station’s primary funding sources? Stokes: Between $3.5 million to $4 million comes from viewers. About $1 million comes from the Corporation for Public Broadcasting, the rest from corporate underwriting and other sources. S-R: The Trump administration has suggested privatizing the Corporation for Public Broadcasting, and a bill has been introduced in Congress to eliminate federal funding after 2019. What would happen if you lost that $1 million? Stokes: We are forward funded, so nothing would happen immediately. But I would hope that the people who support us would try to support us more, and the people who are part of the 85 percent who watch us but don’t give would start contributing. S-R: Do people confuse KSPS public television with KPBX public radio? Stokes: All the time. People call us to complain about programs the radio station aired, or send us donations with KPBX’s call letters on the check. S-R: What do you do with the checks? Stokes: We pass them along. Stokes: (laugh) I hope so! S-R: What is your greatest virtue? Stokes: I would like to visit South America, Africa or Antarctica, so I can say I’ve been to all seven continents. S-R: Can viewers still get KSPS on rabbit ears? Stokes: Yes. A lot of our viewers in outlining areas have tuners for their digital TVs. I myself have two television sets at home with antennas. S-R: Will that ability ever cease? Stokes: Not if we can help it. As long as the technology allows, our goal is to provide free, over-the-air television. Published: Feb. 19, 2017, 5:10 a.m.